FTP is something known to almost anyone who deals with networking of any kind, and especially those of us who have for many years! But FTP even since the beginning has had several remarkable flaws – most notably it’s lax security. While it does have the ability to perform authentication, the credentials are sent in pure clear text, making it staggeringly vulnerable to any kind of efforts to compromise! FTP data can also become ‘lost’ so to speak and isn’t as well controlled, making it vulnerable to being intentionally snatched up away from its intended server/client connection. SFTP aims to, and very successfully does, remedy many of these issues and more. As the ‘S’ in the acronym implies, Secure File Transfer Protocol is indeed, just that, secure. It utilizes SSH and prevents any un-encrypted transfer of credentials and other relevant login information. SFTP also has another advantage – when initializing the first portion of a transfer it will generate a “fingerprint”, which the client system has no idea what is or will be, such that it must be repeated back properly to the server for any transfer to take place. In short, SFTP provides all the same functionality and performance of FTP but removes the glaring and staggering security flaws. For casual transfers between friends or of unremarkable files in a small office it may be no real concern, but anything being transferred that is of any value, or with any kind of public network (remember, even though we shouldn’t reuse passwords, it still happens.. someone sniffing up an FTP password might be able to apply it elsewhere!) should be kept to SFTP! 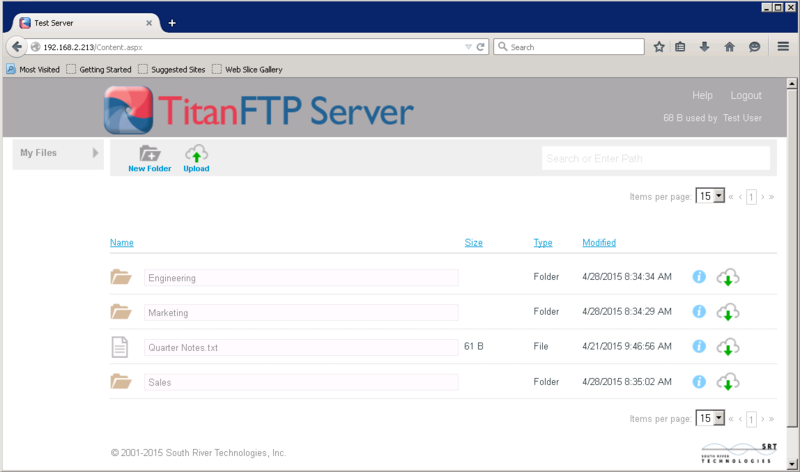 SRT’s Titan FTP Server is another option that is geared much more towards large implementations in need of a great deal for scalability, regulation compliance, and other more powerful features. It’s got a hefty price tag but does offer a free trial, thankfully! It boasts improved compression for faster transfer times, as well as a full range of server compatibility, remote administration, and of course it’s web-based user interface, if the appropriate version is purchased.